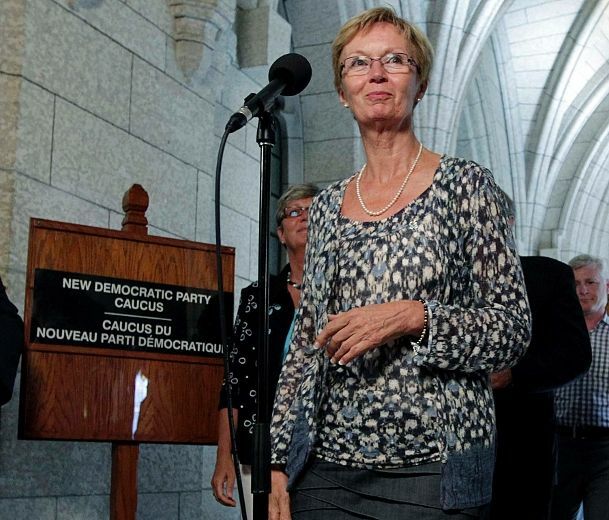 Nycole Turmel is shown holding up her left hand without a wedding ring while announcing that she is off to Vancouver for the gay pride parade and then next on her list of announcements is that later she is off to Montreal for their gay pride. That is the apparent result of one week of brainstorming of the NDP caucus which she says is to make her job easier apparently as a result of experience, yes, experience she first says she does not have and the party has and then in the next sentence its experience she has from 20 years with the party. Run a search on Nycole Turmel and her history , personal history is a BLANK. She has arrived in power similar to Vladimir Putin with a KGB sanitized personal history. So, does Nycole Turmel have personal reasons for placing so much emphasis on gay pride parades? What happened to her personal life? Odds are she was chosen by Jack Layton to promote his agenda of promotion of hatred towards men. You will notice that like Jack "the john" Layton, she has failed to lift her little finger towards a legal presumption of equal parenting. Their obsession is with the extreme feminist movement and promoting non heterosexual relationships which can't make children.